over 550 sq.m. 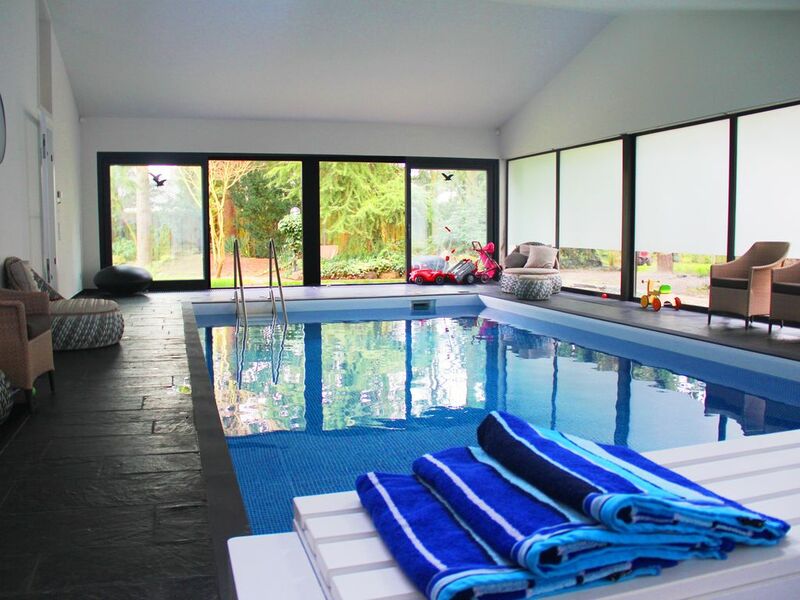 with 7 bedrooms, 5 bathrooms, sauna, tropical conservatory with exotic plants etc. in a 1500 sqm garden. secluded garden. The villa is furnished with quality furniture and design classics of e.g. Vitra, USM Haller, Walter Knoll etc. 30 minutes to Cologne (city center and fair). 10 bedrooms in total, 7 bedrooms, 5 bathrooms, indoor swimming pool, sauna, secluded garden, tropical conservatory with exotic plants. Living room with fireplace, large dining room, fully equipped kitchen, tropical conservatory with exotic plants that bloom even in winter. 2 double bedrooms, 1twin room, 1 bathroom with bath, WC and bidet. Secluded garden with garden furniture and BBQ, ancient trees, palm tree etc. The shopping possibilities are within 5-10 minutes walking distance. Holiday supplement and fairs: 30% on the entire booking. NO PARTIES or LOUD EVENTS !!! Cozy family or group meeting with pleasure. Although the privacy is very good secured here, we are not allowing any kind of parties or loud events. If you are planning something like this, please let us know - we will offer you other objects in similar size and quality. Perfect Location: Supermarkets and tennis club - 5 minutes walk Bus stop - 2 minutes on foot, direct connection to Bonn main station. UKB Clinic - 20 minutes on foot. 15 minutes to Bonn city center 10 minutes to the University Hospital Bonn (UKB) 15 minutes to the International School Bonn 25 minutes Cologne / Bonn airport 25 minutes to Phantasialand 30 minutes to Cologne (city center and fair). View more about Nikita M.
The villa is beautiful and very big ! Super om te relaxen. Netjes schoon. Alle gemakken voorzien. Zwembad was wel koud water. Bus stop - 2 minutes on foot, direct connection to Bonn main station. UKB Clinic - 20 minutes on foot.